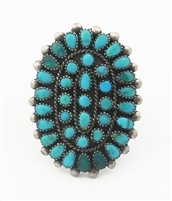 This beautiful Zuni cluster ring is set with 37 beautiful cabochons of Natural Turquoise. 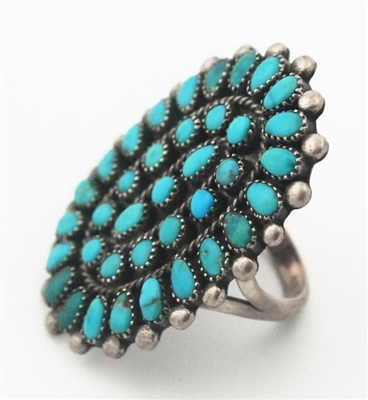 The ring is hand fabricated Zuni work, unsigned as is customary for jewelry from this period. The small hand cut stones are set in fine saw tooth bezels, with accents of twist wire and tiny silver drops on the outer edge. The fabrication is exquisite with precise silver and stone work. 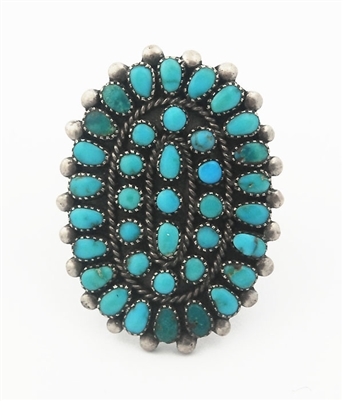 The ring was acquired from an estate with over 7 decades of Native American jewelry collecting. Many of the pieces in this collection were purchased directly in Zuni, from C.G. Wallace of the artist. 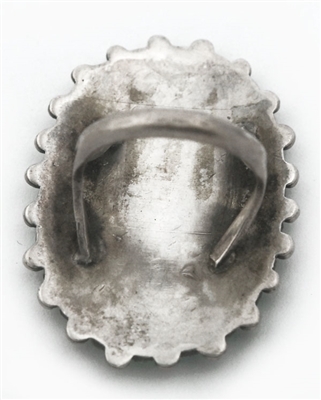 The entire top measurement of the ring is 1 3/16" long by 1" wide, with a very slight curve. The ring size is 7 1/2.